Last week I examined the role that narrative played in establishing Symphony of the Night as a critical entry in the Castlevania series — both as a brilliant sequel and as a work that helped define everything that came after. For this week, I've put together a survey of the workings and mechanics of the game. Another fundamental challenge that the Symphony team had to contend with in bringing the series to PlayStation after a decade of working on 8- and 16-bit systems: The simple question of what, precisely, it means to be a Castlevania game. The series had always centered on whip-wielding and platform-jumping, but beyond that its connections tended to be cosmetic or thematic rather than mechanical. The original Castlevania and its remakes (arcade game Haunted Castle, Super Castlevania IV for Super NES, and Akumajou Dracula for X68000) all took the form of simple, linear, level-by-level action games. So too did the series' portable outings, as well as Bloodlines for SEGA Genesis. At the other extreme, Castlevania II on NES had been a totally free-roaming action role-playing game complete with a quest structure and non-player character dialogue that alternately provided tips and led players astray. And then you had the games that fell in between: Vampire Killer for MSX allowed players to wander between screens within a progressive set of levels, while Castlevania III added branching paths to the original game's linear design. Symphony let players scroll forward and backward at will from the start, but the early portions — such as the lengthy Marble Corridor — have a deceptively linear appearance to them. However, it's Rondo of Blood that most directly informed this game's design. As the direct predecessor to Symphony, Rondo made for a natural touchstone. Fundamentally speaking, it had built on Castlevania III's branching journey concept. Unlike the older NES game, however, Rondo was less obvious about its split paths. Castlevania III forced players to choose from different routes at the end of certain stages, whereas Rondo seemingly led players along a single straightforward path to the end. However, hidden within most stages, adventurous players could find a variant exit that led to an alternate (and usually far more challenging) level. In many ways, Symphony comes across as a direct extension of Rondo's design. It, too, consists of a series of standalone levels in which alternate pathways and secret passages have been discreetly hidden. 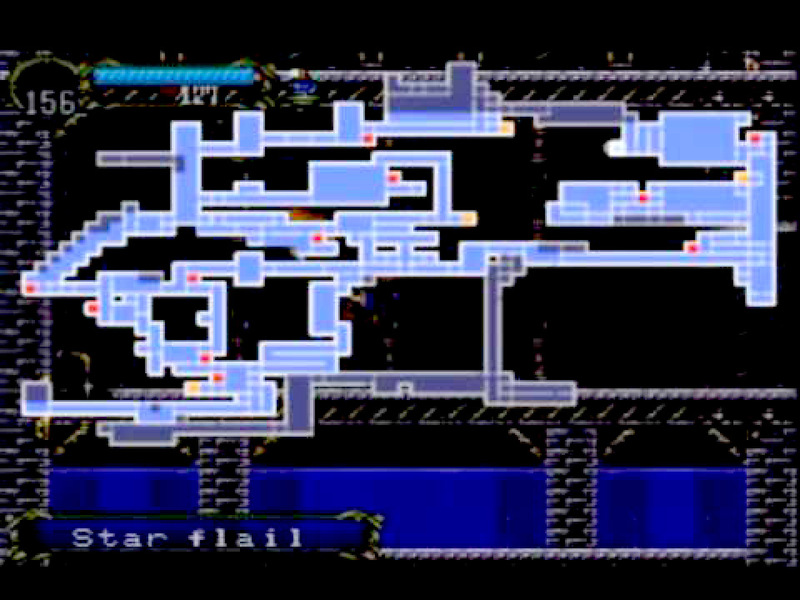 At the same time, the game also draws a line back to Castlevania II: It's broken into separate areas, yes, but each of those subsections of the castle can be traversed freely. There is no direct path to the end, though the flow of the castle map works in such a way that it feels like linear progression to a point... only to confront players with a dead end that forces them to hunt down those alternate pathways. The genius of Symphony's castle design — which, in my opinion, ranks as one of the three or four greatest open-world 2D platformer settings ever — is that its design lures you forward along an obvious path fraught with hazards in the classic platformer vein, then slowly reveals its more open nature. 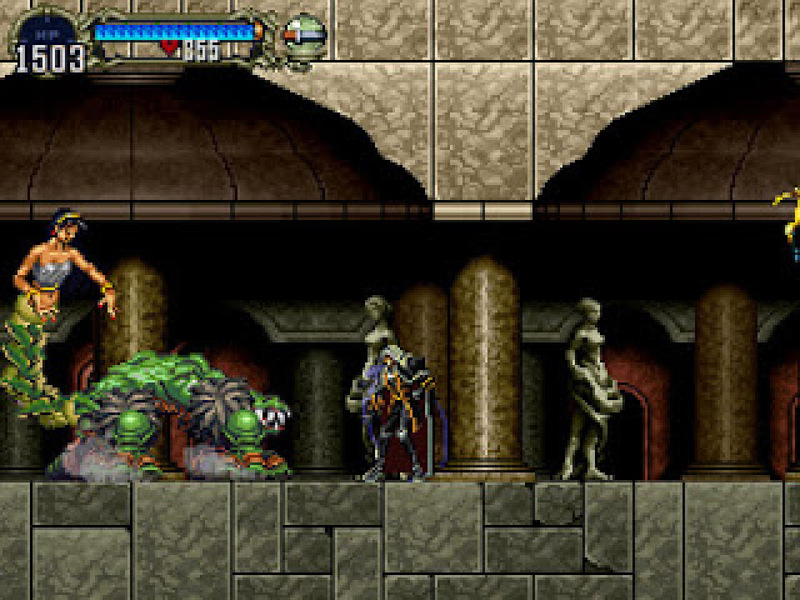 A fan of exploratory play will uncover the castle's interconnected nature fairly early; once you reach the Marble Gallery, the game's third zone, you can stumble across a corridor that stretches back to the opening area of the game (assuming you can survive the two unique and ferociously powerful monsters that lurk along that connector). But it's more likely you'll disregard that path and advance ahead through the Marble Gallery to the Outer Wall, then up to the Clock Tower. You can backtrack significantly at an early point in the game by taking an out-of-the-way corridor leading back to the castle entrance... assuming you can survive the passage's devastatingly powerful guardians. Traditionally, the Clock Tower serves as the final (or occasionally penultimate) level of a Castlevania game, so arriving at that area suggests the game is nearing a conclusion. But no sooner do you venture into the tower's lower exterior area than you find yourself cut off: The bridges that lead from the Outer Wall to the tower proper collapse permanently as soon as you set foot on them. It's possible, with considerable finesse, to make it past the first bridge, but eventually you'll be forced to give up and backtrack, your advance stymied by impassable gulfs. At this point, the game's nonlinear nature begins to reveal itself. The only way forward is to double back — not simply by backtracking, but by taking an alternate (and not at all hidden) exit from the Outer Wall into the Long Library. While this appears to be a dead-end, since it largely consists of platforms far too high for Alucard to reach, the library contains the key to progressing... literally. You can buy the oddly named "Jewel of Open" from a merchant dwelling in the library, which will allow you to open two different sealed, enchanted doors you may have stumbled across on your way to the Outer Wall. The merchant also sells a castle map which reveals the two areas unlocked by the Jewel of Open. Not coincidentally, the map and the Jewel of Open are two of the least expensive items in the shop, creating an extremely low barrier for these essentials; you're almost guaranteed to purchase them, since they're far more affordable than the powerful, expensive swords and armor the merchant sells. At this point, though, the game becomes a quest to explore and discover the tools and powers you need in order to advance. And again, we see Symphony drawing heavily on Rondo. The two games, structurally, aren't all that different; the main distinction between the two comes from how you find alternate routes. In Rondo, you begin the game with a stage select screen whose design vaguely hints at its hidden stages and indicates how much of the game you've explored. 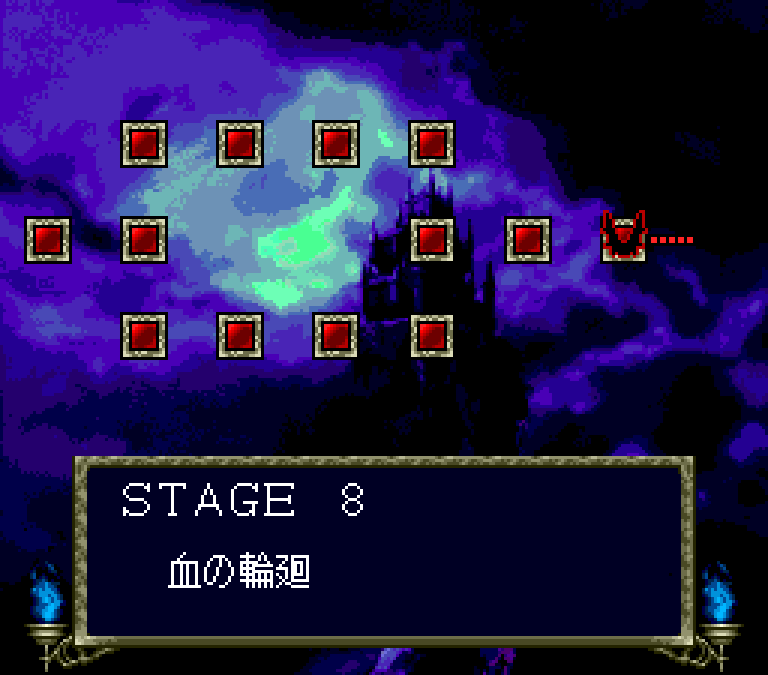 To find a given stage's secrets, you simply need to replay that level from the beginning via the map screen. In Symphony, however, the stages interconnect to one another and allow for free movement back and forth, so you explore without ever breaking from the in-game experience. But if you were to take Rondo's stages and allow players to backtrack to previously completed areas, the result would look largely identical to Symphony... with one major difference. The single greatest difference between Symphony and its forebears? Its protagonist, Alucard. Yes, Alucard — the estranged son of Dracula, whose petulant act of teenage rebellion was to adopt his father's name backward — had co-starred in Castlevania before. He appeared as the optional companion character along the grueling lower route through Castlevania III, wherein he was practically indispensable. His greatest asset was the ability to transform into a bat, which made sequences where you have to climb the screen by navigating a pile of randomized falling blocks trivial rather than infuriating. 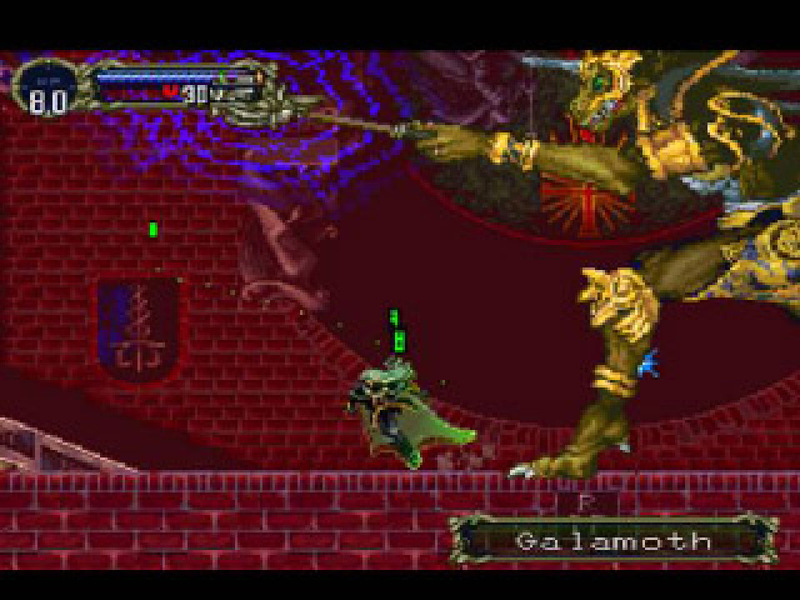 That Alucard, however, played nothing like the lithe demihuman who stars in Symphony. 8-bit Alucard moved slowly and, besides transforming into a bat, possessed only a single combat skill: The ability to fling balls of energy, just like dear ol' dad. His middling speed and surprisingly weak offensive power made him, frankly, the least valuable contributor to Trevor Belmont's team. This Alucard, on the other hand, fights like a vampire ninja. He moves with agility, and more importantly, he commands a far greater arsenal of skills than the paltry fireball-toss from his NES appearance. Symphony's creators returned to the source material for inspiration here — by which I mean Bram Stoker's novel Dracula. Alucard can transform into a bat, yes, but he can also shape-shift into a wolf and even into a cloud of mist. Stoker's limitations also come into play: Dracula in the novel couldn't cross running water, and until you locate a holy symbol, stepping into water will cause Alucard harm. 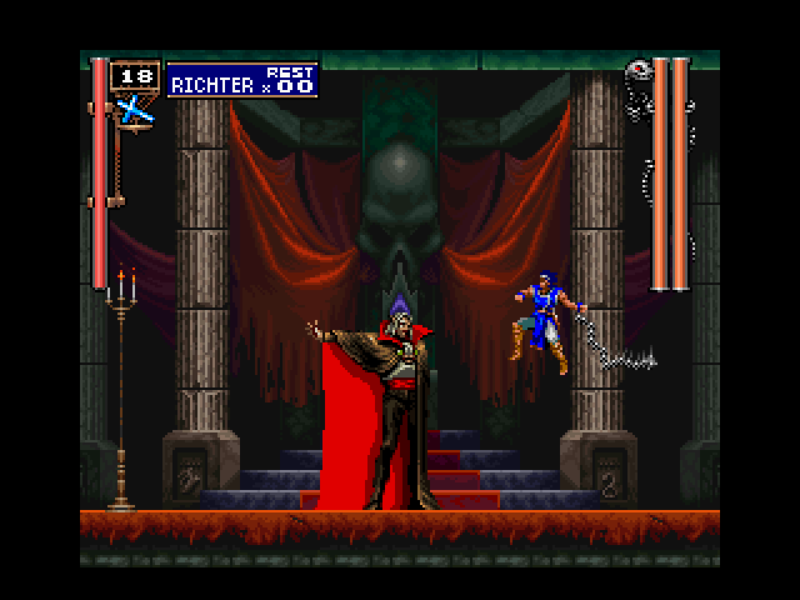 Symphony's Belmont-centric prologue does more than simply call back to the previous game; it also provides a "classic" Castlevania mechanics reference point so you can better appreciate the way Alucard moves and fights compared to the series' usual protagonists... and to connect Alucard's hidden powers to his father's. 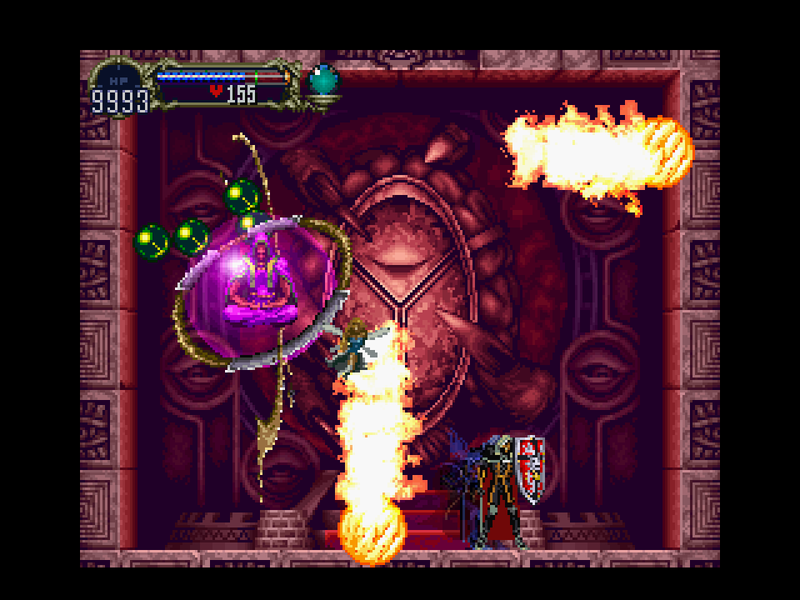 Alucard can still throw fireballs, incidentally, and as on NES they work just as Dracula's do. In this case, he commands the skills his father demonstrates during the opening prologue: Both the standard spread of triple fireballs and (with the use of a secret button modifier) the two large energy orbs that fire straight ahead one after the other. You could easily complete the game without ever realizing Alucard commands such a power, though, because it's activated by a secret fighting-game-like controller combo that's only mentioned in a submenu... one that remains locked until you actually activate the power. Along with this power, Alucard can also steal energy from all foes on-screen, use his vampiric powers to regain health by wounding enemies that bleed when cut, and summon a ghost to seek out and attack enemies. None of which is explained in advance. And that's fine, because as with so much of Symphony of the Night, these skills are extra grace notes. Just as you may not realize the castle has an open, interconnected design if you tackle the early hours of the game as if it were a classic, linear Castlevania game, you can more or less complete the whole adventure without delving into the full extent of Alucard's capabilities. Again, you'll eventually need to use the Mist and Bat transformations in order to reach certain out-of-the-way areas, but otherwise few of the hero's most impressive skills feel essential. Alucard can equip not only a vast array of weapons, but also accessories and tools that make him practically indestructible under certain circumstances. For instance, you only encounter kittens in a handful of areas... but in those spaces (and those space alone), the bracelet that causes you to gain health when you collide with kittens can be invaluable. That, in large part, has to do with the fact that Alucard's basic combat capabilities — even without spells and skills — make him an incredibly capable fighter. Where Belmonts could only hope to power up their whip through stages and use some secondary weapons, Alucard relies instead on a handful of bladed and blunt weapons. Swords of all styles, spears, hammers, and even brass knuckles serve as the foundation of his combat repertoire. In story terms, this would help set the Belmont clan apart from allies like Alucard; the family doesn't use "whips," they use a whip, enchanted to possess great power against evil, handed down from one generation to the next. Alucard, being vampiric himself, would be incapable of wielding that holy weapon. But it also serves to give Alucard a distinct play style... and to justify the game's role-playing dynamics. 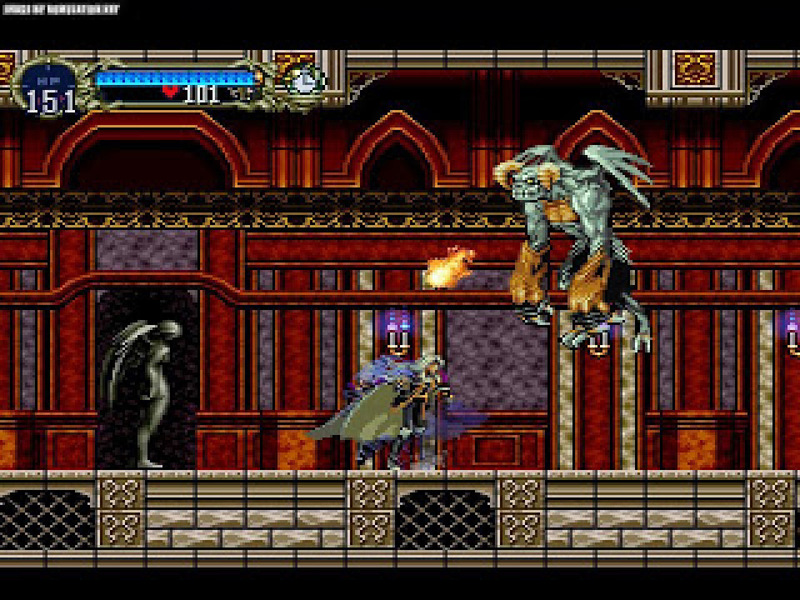 The greatest advantage Alucard has over previous Castlevania heroes, at least in terms of changing up the game's structure, arises from his ability to carry an enormous amount of equipment. Simon Belmont managed to get some use out of magic crystals and special subweapons in Castlevania II, but his paltry selection of gear was nothing compared to arsenal that Alucard amasses. Some of these turn out to be essential tools; others have little apparent value but contain interesting little secrets or hidden powers to allow players to customize Alucard and play the game according to their preferred style. You can control a brawler Alucard who punches enemies to death, or an Alucard who prefers to use the Shield Rod to summon special spirits to do the hard work for him, or perhaps build a luck-centric version of the character whose physical frailty is balanced by his ability to land frequent critical hits and acquire rare gear. You can even customize Alucard's look by giving him different cloaks, including one that turns him transparent, or boots that appeal to his vanity by doing nothing but make his sprite one pixel taller. Whatever your preferred Alucard, Symphony can make it happen for you. Most of all, though, the sheer number of weapons and tools Alucard can find and use transforms Symphony into a new kind of game for the franchise, one that looks and plays the same in many ways but ultimately proves to be far more adventurous in design than previous entries in the series... which I'll write about next week. Sorry, I guess I lied about tackling that topic in this week's column. The downside to Alucard's RPG-inflected capabilities: It's all too easy to make him so overpowered that the game becomes a breeze. A matter for next week's entry. Tagged with Analyses,	Classic Deep Dives,	Design in Action,	PlayStation,	Retro,	symphony of the night.